Walking through the Stitches West 2019 market, this drew my eye. 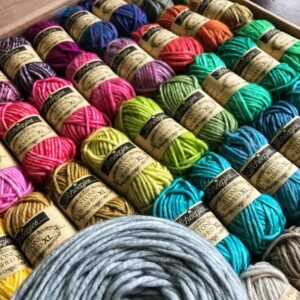 A sampler of color – Scheepjes Stone-washed XL. Just begging to be knit into an Annetarsia project. 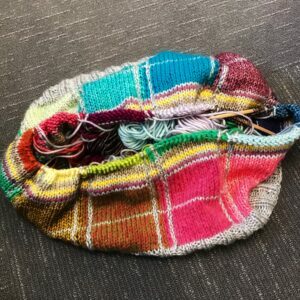 At 1260 total yards, I was pretty sure that it was a sweater’s worth, but I hedged my bets and started looking for a solid color yarn that could frame the different colors. I found it at Four Purls Yarn Shop, where I was teaching the following week. Cascade Yarns “Sonata” was bulky, light weight cotton/merino blend, which looked pretty good next to the Cotton/Acrylic Scheepjes yarn. 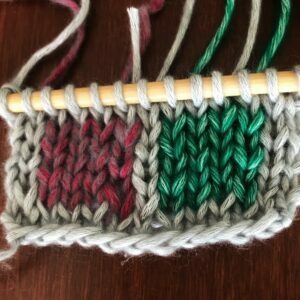 The next step was to knit a test swatch. A pretty good match, knit on a size 9 needle. I was looking for an over-sized, sweatshirt style pullover. One that would be comfortable and light, and unrelentingly cheerful. I wasn’t sure about the windows of my swatch, and I wanted larger blocks of color. So, I started designing a plaid. Here is the first layer of squares. There are a total of 10, all around the body, which measures 44 in. circumference. Nice and roomy, for me. All of the yarn butterflies are in the middle of the knitting. You can see them peeking out if you look! 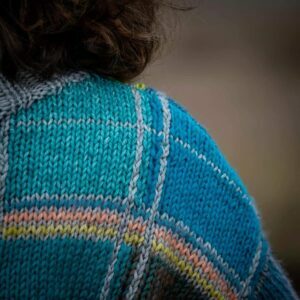 I worked Annetarsia ITR, of course, up to the armholes, then divided for the front and back. 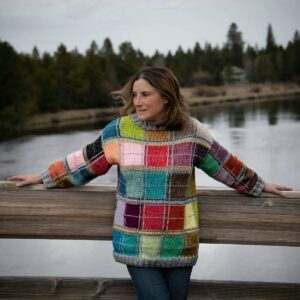 This sweater was knit with a specific sampler of yarn, but you could make one with leftover stash if the yarn was all equivalent weight. I’m not going to write this up as a pattern, but here is a link to my notes and chart, if you want to see what I did. ‘ square sweater notes. Click here for the link to my Ravelry project page.